I'm sure Democrats believe this chart and want others to. But, going to the very source the Obama campaign claims to use we find. 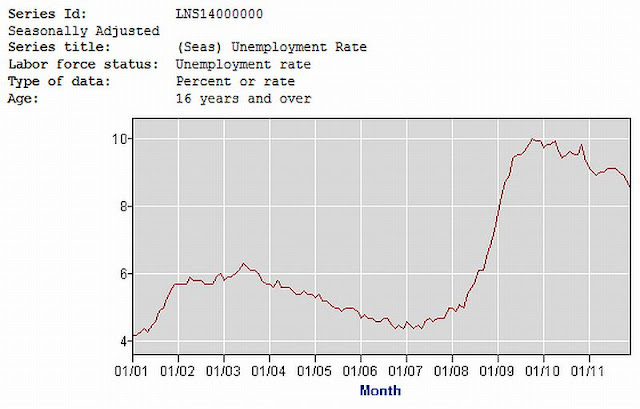 If you note, when Democrats were swept into congressional power in January 2007, in order to correct an "unbearable" unemployment rate, the rate of unemployment was 4.7%. After two years of their "fixing" things under the leadership of then House Speaker Nancy Pelosi and Senate Majority Leader Harry Reid, unemployment grew to 7.8% when Obama was inaugurated in January 2009. After peaking over 10.0%, the national unemployment rate did not drop below 9% for well over 2 years. The current 8.5% does not include those who ran out of unemployment compensation and just dropped off the unemployment roles or those who once worked full-time and are now part-time at a much lower wage. As the following chart shows, again from the very same Bureau of Labor Statistics Obama's campaign claims to be using, unemployment remains much higher than when Obama took office. 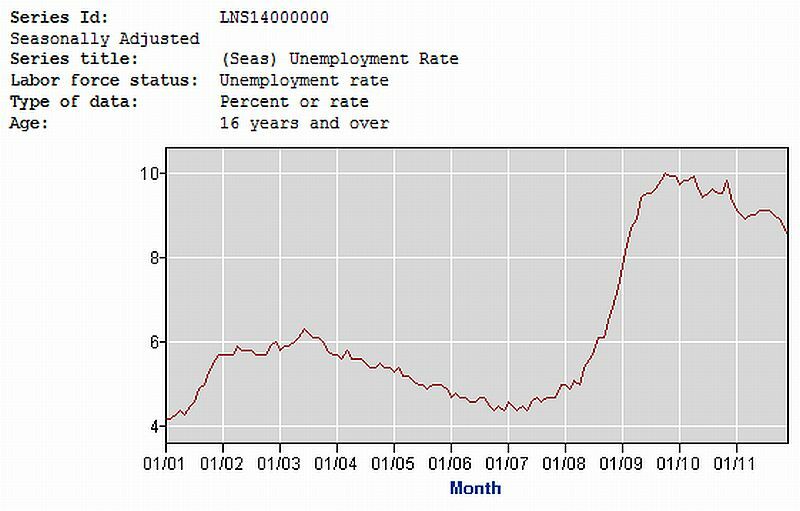 I don't know what sort of math the Obama campaign is using, but when I see unemployment much higher today than when he took office, I tend to believe that there has been no job creation. If the claim of all of those jobs being created were true, unemployment should be lower, not higher than when he took office. Don't fall for fancy looking charts. Look for their sources to verify claims as I did and you will realize that Barack Obama does not deserve a second chance. Remember, it was he who said if he couldn't fix the economy in three years he would be one term president. He not only hasn't fixed it, he's made it much worse. 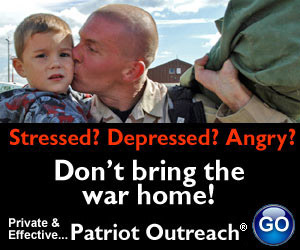 It's time to take America back and send both Obama and his Democrat cronies to the unemployment line.